WWF’s “Solarising Communities” project launched in 2016 installed on-grid solar PV systems on the rooftops of three stilt houses in Tai O, demonstrating the city’s potential to develop solar energy. The project is now being extended with a 100 per cent solar-powered mobile café that will visit different districts around the city. 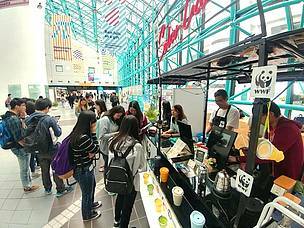 The solar café aims to offer the public a taste of solar energy and collect opinions on renewable energy development. These will help WWF to drive policy advocacy by urging the government to promote the development of renewable energy with an ambitious 10 per cent renewable electricity target by 2030. 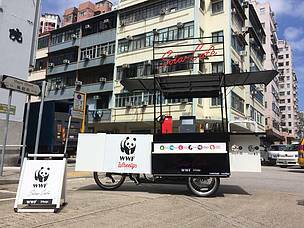 WWF-Hong Kong believes that community engagement, including general public and private investors, plays a critical role in shaping Hong Kong’s renewable energy future. 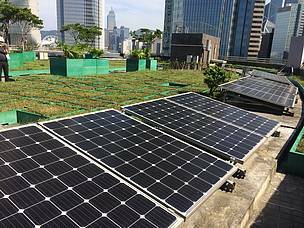 The government has announced the adoption of WWF’s recommendation to set the initial feed-in tariff rate at an attractive level of HK$3-HK$5/kWh for solar and wind systems with a guaranteed rebate period of 15 years. How will rebate rate affect the payback period? In 2017, one unit of electricity cost around HK$1.10 and most of it is generated by burning fossil fuels. 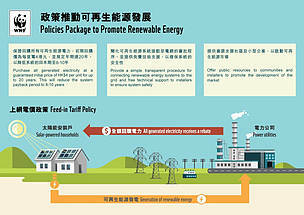 In addition, WWF urges the Hong Kong government to increase the share of local renewable electricity use to 10% by 2030.